The Portable Digital Microscope with Integrated Wi-Fi! Visio-tek is a line of versatile and portable imaging solutions that utilize both Wi-Fi and USB transmission. Visio-tek digital microscopes and cameras can be connected to iOS and Android smartphones or tablets via the dedicated Visio-tek App, as well as to Windows or Mac computers or laptops through a Wi-Fi/USB connection. Using theVisio-tek free software and application, you can capture, store pictures and video, and take measurements. Visio-tek microscopes allow Wi-Fi inspections anywhere an image magnification is required and includes Standard, Polarized, Ultra-violet, Infra-red, and High Magnification portable scopes from 10x up to 600x. Listed values may differ slightly. Working distances have been taken without front cap. Note: On some surfaces, the use of white light magnification may result in glare, in which case a polarizer is recommended. Please see Cat. #92102 which offers increased contrast. Our best-selling model. The polarizer lens decreases glare on plastic, glass, metals, minerals and paper, resulting in a darker, more saturated, sharper image, with increased contrast. Same features as Cat. #92102 but with 5 mp resolution (USB mode). For applications where elements are made with chemical structures that react to UV light. From White to UV hold LED button 3 sec and vice versa. This microscope incorporates polarizing light with UV light. You will find both Cat. #92102 and #92104 features in only one device. From White light to Polarized hold LED button 3 sec and vice versa. From UV light to White light press LED button 9 times. For scientific and medical applications where UV or IR light is required. From White light to IR hold LED button 3 sec and vice versa. From IR light to UV light press LED button 9 times. 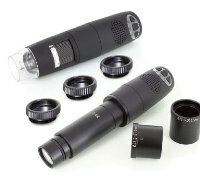 Designed for applications where increased clearance is beneficial while working under magnification. Viewing at a greater magnification also provides a wider viewing angle. Our highest powered model for applications requiring the greatest magnification at close range. Visio-tek Scope is a complete solution with a digital C-Mount Wi-Fi Camera (Cat. #92111) that allows you to wirelessly digitalize any traditional optical device in seconds. Compatible with all optical microscopes, the Visio-tek Scope digitalizes images and takes measurements and photos from your standard optical device using your tablet, smartphone or PC, with dedicated App and Software. The images can be displayed on different devices simultaneously. It is a very useful accessory for optical microscopes. Kit includes Cat. #92111 Wi-Fi Camera, Cat. #92113 Lens & Adapters andCat. #92114 Spacer Rings. Kit includes Cat. #92111 Wi-Fi Camera, Cat. #92113 Lens & Adapters and Cat. #92114 Spacer Rings. Digital Wi-Fi Camera (C-Mount) for Optical Instruments & Devices. Kit of C-Mount Lens 0.4X/23.2 mm plus 30 and 30.5 adapters. Can be used in phototubes, trinocular tubes, or eye tubes with 23.2 mm. It will allow you to connect your optical device, such as a microscope, with the Visio-tek Eye Cameras (Cat. #92111 and #92112). Kit of 3 C-Mount Spacer rings. Rigid vertical desktop rack that provides about 20 cm of vertical distance from the object. Vertical/desktop rack that utilizes an adjustable sliding horizontal boom arm with up to 25 cm reach and 360° rotational capability. It is ideal for inspection applications where the ability to extend over and across a specimen is required. Rack with a flexible gooseneck arm that can be bent and twisted in many positions. Up and down knobs are used to adjust the distance between microscope and object. With the removable X&Y crossed, you can slightly adjust the position of the object by rotating the knobs. You can turn on and off the LED backlight source thorough the brightness control knob to enhance the object clarity.